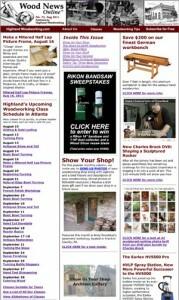 That’s right – the August 2011 edition of Wood News is out, and it’s another good one. This month, we’ve got a new column from our Down to Earth Woodworker, where he updates us on the progress of his new workshop, including installation of stairs to the second floor, a couple windows, and an inviting new door. Steve also takes some time to talk about deterioration of basic woodworking skills as well as show off his own MacGyver-esque skills when it comes to emergency sharpening. We’ve also included a great article by one of our customers about strategies for coping with arthritis while woodworking, as well as some great new submissions to our Shop column, our Show Us Your Stuff column, and our brand new Carving column, this month featuring the work of Kari Hultman, aka The Village Carpenter. Maybe you’ve heard of her? All this plus some great new products to check out, including a preview of Charles Brock’s new sculptured rocker DVD AND a new giveaway, this time featuring some great Rikon tools that would look fantastic in your shop. So what are you waiting for? Go take a look at this month’s Wood News…right now! Check out the April Wood News! Check out the March Wood News!